Are you spiritually withered? Do you find yourself lacking the fruit promised to believers by the Apostle Paul? Well, how's your connection to the Vine? In his discussions with his disciples, Christ used the picture of a plant to illustrate the relationship between Himself, the life-giver, and his followers, the life-receivers. Andrew Murray examines this metaphor, taking the reader beyond a mere surface application of this truth to realize the absolute necessity of "abiding in the vine." "Apart from me, you can do nothing." We can't try to be spiritual. We can't even try to be good. All of our strengths and all of our blessings come as gifts from our heavenly Father. Examine the fifteenth chapter of John with this skilled Bible scholar. 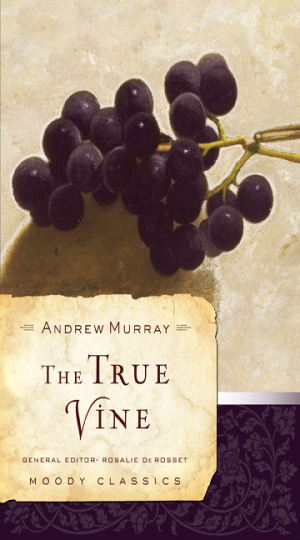 True Vine by Andrew Murray was published by Moody in October 2007 and is our 19287th best seller. The ISBN for True Vine is 9780802456557. Be the first to review True Vine! Got a question? No problem! Just click here to ask us about True Vine.